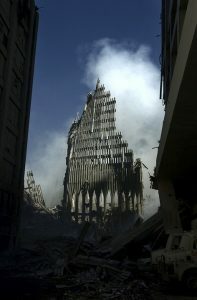 In the 9/11 attacks at the World Trade Centre, Robert Small worked on the seventy-second floor of the South Tower. He was tasked with helping people walk down the extremely long staircases after the planes had hit. Along the way, he met a woman who was four months pregnant. It was such a long way down that she wanted to stop, but Small kept encouraging her to go down one more floor. Without his help, she and her baby would not have survived. That woman, I’m sure, is forever grateful, and will never forget Small. But what about her child? His or her life was saved, and that person is now probably seventeen years old, but has no memory of the terrifying experience. Do you think that child would be as grateful as the mother? There might even be a danger that this child wouldn’t care. It’s centered on this truth: Jesus gave everything for us. In the Garden of Gethsemane, St. Luke’s Gospel, which we heard today, says, “In his anguish he prayed more earnestly, and his sweat became like great drops of Blood falling down on the ground” (Lk 22:44). Many believe that Jesus actually sweated blood, because it’s medically possible when under great stress. But we know for sure theologically that Jesus took on all of our sins, and the weight would be overwhelming and almost unbearable (Cf. CCC 615). He was betrayed by His twelve apostles, His friends (Cf. Jn 15:15). St. Luke’s the only one who records, “Judas, is it with a kiss that you are betraying the Son of Man?” (Lk 22:48). St. Luke alone tells us that, at the very moment when St. Peter denied Jesus, “The Lord turned and looked at Peter” (Lk 22:61). Has that ever happened to us: When we get let down by the people on whom we’re counting? Our family and friends are supposed to be there to help us, and they let us suffer. 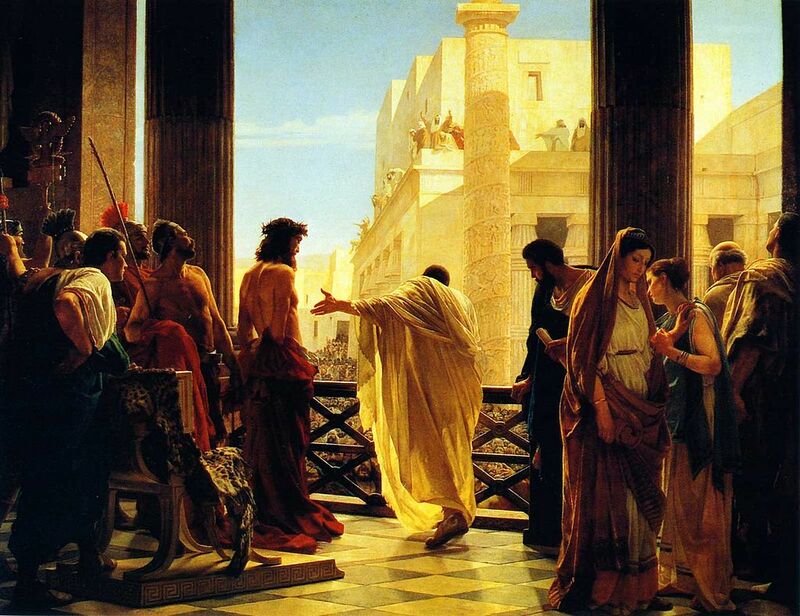 While under trial before the high priest, Jesus was mocked, blindfolded, and beaten (Lk 22:63-65). It’s St. Luke who tells us that Pilate sent Jesus to Herod, where He’s questioned, mocked by having to wear a fake robe for a king (Lk 23:6-11). When He’s sent back to Pilate, Pilate has Him scourged. Many of us who have seen The Passion of the Christ know how horrific the scourging was, how it would tear Jesus’ skin right off His body. Some researchers of the Shroud of Turin estimate there are over 100 cuts all over Jesus’ body. Do you know why Simon of Cyrene was forced to carry Jesus’ cross (Lk 23:26)? Because Jesus had no more strength to carry it. And, as I mentioned once before, many believe that Jesus died so quickly on the cross (only three hours rather than days) because He died of blood loss. Jesus gave everything for us! The Church teaches that Jesus “knew and loved us all when he offered his life” (CCC 616). He saw all of us when He was dying, and He did it for us. And St. Paul realized it’s even more personal: Christ “loved me and gave himself for me”(Gal 2:20). That’s the kind of joy and gratitude we should all feel. And, if we don’t feel that, we can ask for it. St. Ignatius of Loyola says that, when we pray or meditate on the Passion of Jesus, we should actually ask God for “pain, tears, and suffering with Christ suffering” (Spiritual Exercises, 48), and we can ask for immense gratitude. Every year, the survivors of 9/11 go to Ground Zero to remember the people who died for them, but we have an opportunity to thank Jesus face to face, because, the night before He died, He established His own memorial: “Then Jesus took a loaf of bread, and when he had given thanks, he broke it and gave it to them, saying, ‘This is my body, which is given for you. 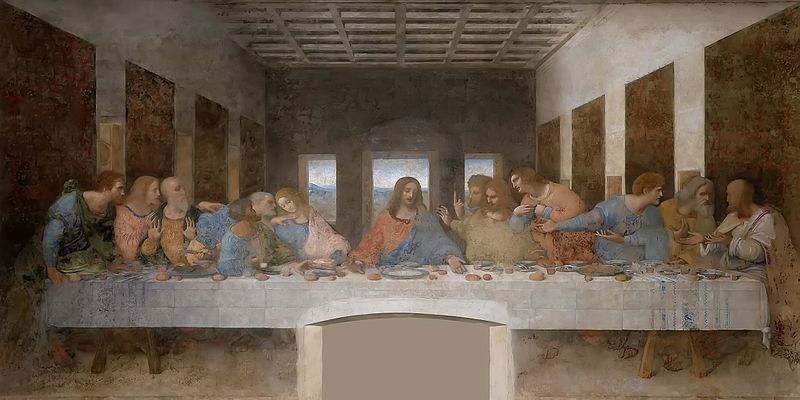 Do this in remembrance of me.’ And he did the same with the cup after supper, saying, ‘This cup that is poured out for you is the new covenant in my blood’” (Lk 22:19-20). 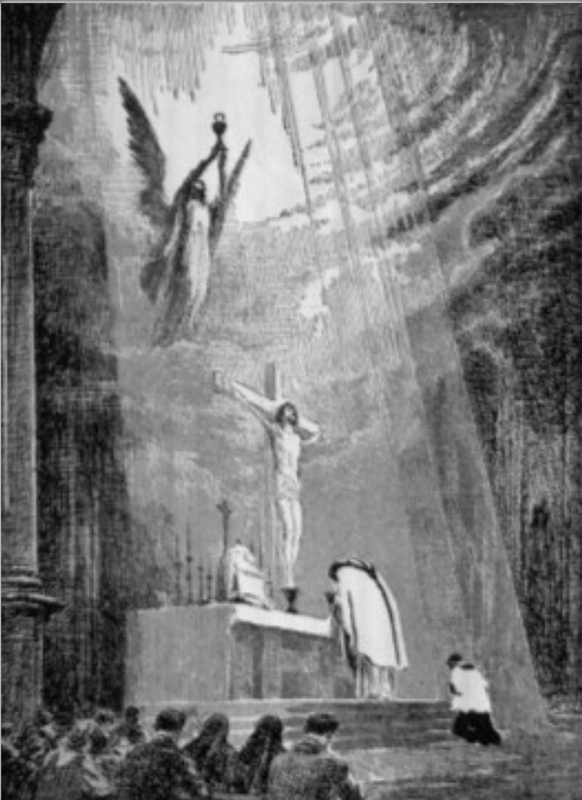 Because of Jesus’ words, the Church for all time has taught that He is present in the Eucharist, “truly, really, and substantially” (CCC 1374).These three adverbs are the keys to understanding the real presence of Jesus (Avery Cardinal Dulles, How Real Is the Real Presence? in Church and Society, 456). When the Church says Jesus is “truly” present, she means that it’s not just a sign pointing to Jesus in the heavens, but that He’s truly here. When she says He’s “really” present, she means at the level of being (for those who know philosophy, this means it’s ontologically real). So, even if no one believes Jesus is present in the Eucharist, He’s still there. In addition, when the Church says He’s “substantially” present, she’s referring to that reality beneath the appearance of bread. This is why the Eucharist is at the heart of our parish and nothing can come before it or happen without it. So, what’s better: Spending time with a person we love, or spending time with a picture of that person? There’s no comparison. This is a critical question for us Catholics, because we are tempted to make excuses about participating every Sunday at Mass or visiting a church during the week. 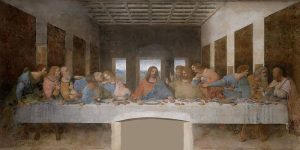 We may think, “God’s in creation too, so I don’t need to go to the Eucharist.” But that’s like spending time with the picture of someone rather than the actual person. I’m not saying we have to choose exclusively between spending time with God in nature and spending time with Him in the Eucharist. It’s not either-or, but both-and. When we recognize Jesus’ beauty in creation, then we’ll be moved to spend time with the Creator face to face. Vice versa: not only do we spend time with Jesus in the Eucharist, but we appreciate His creation. That’s why we spend time with Mary and the saints: Mary and the saints are the greatest handiwork of His creation. 1) Recommit to participating at Sunday Mass every Sunday. The first step is to decide to stop making excuses. Here at this parish, we’ve had an abundance of teaching on the Real Presence, on the benefits of Sunday Mass, and the reasons why Jesus has made it a grave moral obligation to participate every Sunday. Today we have another reason: It’s a matter of thanking the one Who saved us and gave His life for us. And all of us who already go every Sunday are being challenged to go more during the weekdays—this is the challenge of love. How much do we love the Eucharist? There’s a great temptation to be complacent in our Eucharistic devotion. We too can make a lot of excuses on why we don’t come when we can. 2) Think once again about committing fifteen minutes a week to Adoration. Once we know the opening date of our Adoration Chapel, we’ll tell you. It’s looking like May now. Sorry about the delay. By the way, it’s not our fault! The pieces of art have arrived in Canada and are now being shipped by train from Montreal. 3) This Thursday, which is Holy Thursday, we have Adoration downstairs in the parish lower hall from 9 p.m. to 3 p.m. on Good Friday. This is a huge treat! 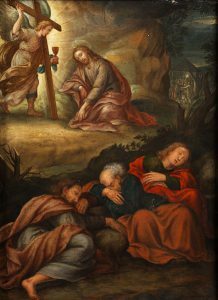 It’s supposed to be imitating Jesus in the Garden of Gethsemane up until His death. The setup is spectacular with light from hundreds of candles. My hope is that this Thursday, all of us, including those of us who have never done Eucharistic Adoration will give it a try. Since many of us don’t have work the next day, because it’s Good Friday, I want to invite you to try coming, and experience the graces, the peace, the joy, the consolation. I guarantee it’ll be a beautiful experience and will prepare us for fifteen minutes a week in the future. Try coming at a crazy hour, like 3 a.m. when you can’t sleep. I said, “You can’t sleep, because you hear a call to spend time with Jesus.” Besides, we do need men present at every hour for security purposes. 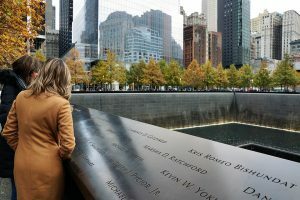 I suppose we could classify 9/11 survivors into two categories: those who remember and are appreciative, and those who are ignorant and apathetic. Those who are grateful to the rescue workers go every year to Ground Zero for the memorial. They have to go to the place where they were saved and thank the people who saved them. In the same way, we have to go to the place where we were saved, Calvary, which is made present again at every Mass. We need to thank the person who loved and saved us, Jesus Christ. These two drawings communicate what Jesus did when He gave us the Mass. 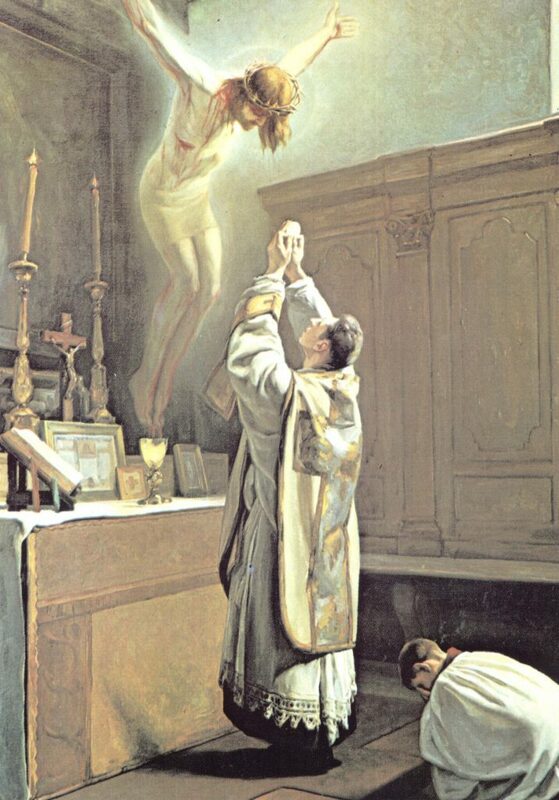 Every time we celebrate Mass, His offering of Himself to the Father is made present in our time. This is where we encounter Him Who gave everything for us.